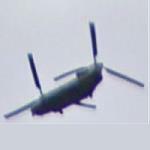 Chinook? (2-rotor helicopter) flying over Cerne Abbas, UK. Spotted by Google Streetview car.